As a songwriter, he is without parallel. As a guitarist and vocalist his warmth and eccentricity are instantly recognized. As a public figure, he’s always used his fame to stand up for underdogs and regular folks of all stripes. If there’s one thing Willie Nelson isn’t known for, it’s his acting. To be fair, expecting Willie Nelson to deliver credible acting performances is like expecting John Wayne to play a good Othello. Their strength as a performer is so rooted in their persona, they can really only add variations and shades of the same character over and over again. Part of it also that, geez, it’s WILLIE NELSON. You don’t get to write a million timeless songs, record a million albums, tour a million miles and be the closest thing to an actual Uncle Sam AND get to be a good actor too. That’s just gilding the lily. At it’s heart the movie is a Saturday Matinee western, the sort Willie’s heroes Gene Autry or Roy Rogers would star in. Willie is the singing cowboy with a very large and chemically active bunch of sidekicks, roaming the west song by song. The stakes are never particularly high, because we know Willie is the hero and he’s going to win. But it’s fun to watch the hero go through the motions. The villain isn’t particularly evil, because, well, Willie is basically the villain of this movie too. Willie plays Buck Bonham, country singer, nomad, family man. His old buddy/guitar player Slim Pickens retires and Willie hires Slim’s daughter (Amy Irving) to take her place. Willie and Amy are musically sympatico, and that leads to other more intimate dalliances that shatter his marriage and friendship. Eventually though, Willie is able to make amends, save his marriage, get back on Slim’s good side and put on the big musical jamboree at the end. In Willie’s world, everything begins and ends with songs. Music sends him out on the road, complicates his life, mends it, brings everyone back together. The movie isn’t without it’s faults. It’s soapy and melodramatic. It leans a little too heavily on performances. Willie, for such a laid back guy, is a wooden actor. It’s the joy of performing though, the love of playing music with and for people that sells the movie. Music, and the way Willie engages the world most directly through it, is the real focus of this movie. We get an idea of who Willie, or in this case Buck Bonham, is, but we don’t KNOW who he is until we’ve seen him sing his life to a crowd of strangers. That’s the central paradox in many performers lives, though. Singers might be strangers to us, and they may guard their private lives or even mislead us with stories, when they’re singing their songs, they’re baring all their vulnerabilities for us. Few people have been doing this longer, or better than Willie Nelson. Posted in Movies, Music and tagged country music, Willie Nelson. Bookmark the permalink. Regret is as native to the human soul as hope, it’s the leavings of will and choice. This is the dark and fertile soil Larry Hooper tills on his new e.p. Opening with “Rehearsed Alibis”, the sort of dirge Townes Van Zandt excelled at, this is an efficient recording that cuts right to the quick. “I Was Wrong” is steady, heartfelt number about plain spoken regret, a man bearing up to the mistakes he made and love he lost. “Daydreams” finds the singer plugging ahead through doubt and tough times. Clean, sympathetic production aids Hooper in getting across his words without any distracting frippery, all that would be beside the point. These songs are about swimming upstream, and Hooper plays with the conviction of a man swimming upstream, or even better, of Matt Saracen pulling off another win for the Dillon Panthers with nothing but heart and hard work. While the songs all touch on regret, doubt, and choice, there’s enough range in subject matter to keep this from becoming a monochrome affair. In fact, one of the reasons I enjoy e.p.’s is that they afford an artist the perfect amount of space to explore all the facets of a mood or idea without getting draggy. Hooper has shown his range before in his full-length album “From Here To The Stars,” which includes some really nice love songs and perhaps the best rejoinder to the Westboro Baptist Church put to tape. Like Matt Saracen in the preceding paragraph though, this e.p. seems to be about focusing in on some fundamentals, and like Matt Saracen, it pulls in a win. 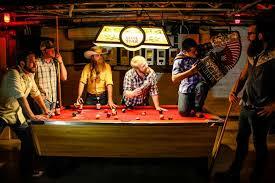 Posted in Music and tagged country music, Larry Hooper, texas music. Bookmark the permalink. A lot of Texas music is only Texas music by virtue of name-dropping. 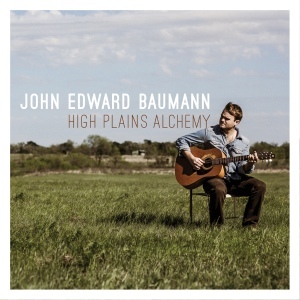 “High Plains Alchemy”, the newest from John Edward Baumann is Texas music because it talks specifically about Texas and day to day life there in the second decade of the 21st century. In a conversational tone close to that of Adam Carroll, Baumann explores the state’s economic boom, the possibilities in wind farming it’s plains and the burgeoning hipster scene in Marfa. It’s wry and observational, full of details about the economy and environment. It’s a tasty musical equivalent to your town’s alternative newspaper, the one that’s a little left leaning, but clever and clearly a crusade. With solid country backings that are “laid-back” in the sense that they’re not chest-beating bar stompers, Baumann tells the tale of daily life full of little gems hewn from close observation. The Chihuahuan princess in “One Night In Marfa” probably fled the violence in Juarez. “Eagle Ford” finds the singer rushing to get in on the black gold rush and put low paying liberal arts degree jobs behind him. “Dogs” is a charming, scruffy tale about faithless pets and cheating women that seems like it was beamed in from the cosmic cowboy heyday of 70’s Austin. While never once mentioning a book, or using a word you wouldn’t hear in your average bar, Baumann has created a literate, funny, and charming album that manages to come across as a both a breezy record and a short story collection of hummable literature. Some songs set out to be the song of the summer, this album feels more like a summer roadtrip, a quick hop, skip and jump across the Lone Star State in the hands of a musical Eagle Scout. Posted in Music and tagged country music, john edward baumann, texas music. Bookmark the permalink.